You may realize that Pryor and its surrounding areas have a fascinating and unique history. But did you know the Pryor Public Library has a rich history all its own? The earliest beginnings of a library in Pryor start in 1914 With the I.O.O.F. (International Organization of Odd Fellows) and their female ancillary organization, the Rebekahs. The Rebekahs spearheaded a project to provide a free library, which was housed within the I.O.O.F. Lodge. Going forward a few years, the Pryor Busy Bee Home Demonstration Club also organized a free library project to service the citizens of Pryor. 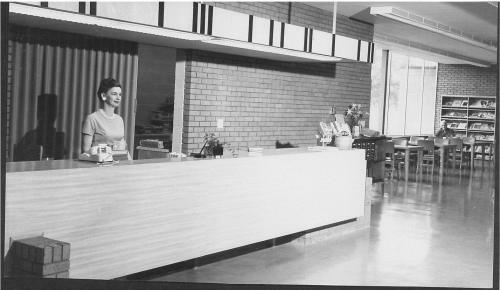 Starting in the early 1930s, the library was shuffled around to a few different locations including a couple of downtown shops. At one point the library was lodged within the home of a Busy Bees Club member! 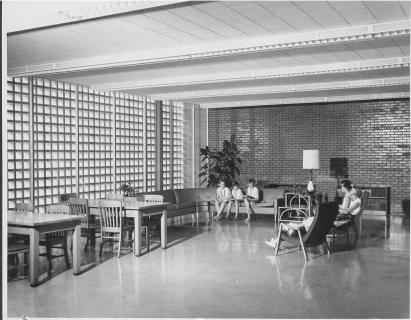 In 1938 enough support was garnered within the community to start a public library on an institutional level. The City of Pryor voted and approved a levy in its budget for a real, bonafide public library. The Pryor Public Library became a real thing! You may have an idea about how the rest of this story goes: in September 1939 the library moved to the Graham Community Building. 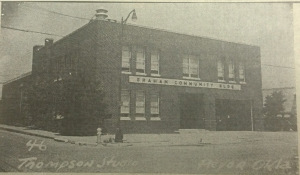 In 1958, after generous contributions from Thomas J. Harrison, the Pryor Public Library found itself in a brand new building at 505 East Graham – where we remain to this day. 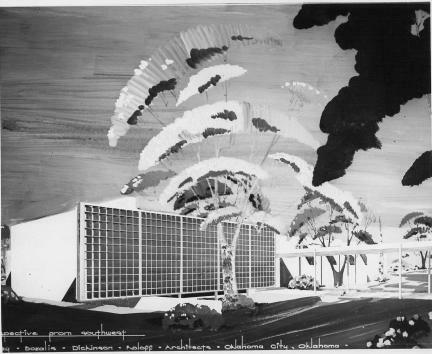 Design Concept for the Pryor Library by famed mid-century architectural firm Bailey, Bozalis, Dickinson, Roloff Architects, Oklahoma City, OK.